BANGI, 4 November 2014 – Subtle changes in the way the National University of Malaysia’s (UKM) 42nd convocation and its carnival were organised had successfully attracted more attention from students and outside visitors alike. 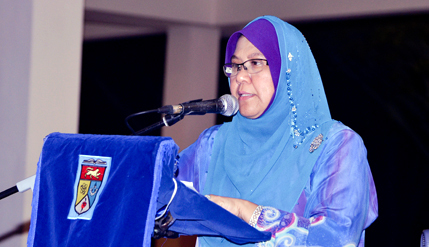 Deputy Vice-Chancellor (Student and Alumni Affairs) Prof Datin Noor Aziah binti Mohd Awal said the carnival also helped students to learn about managing complex and big events. She was addressing the closing ceremony of the carnival held at Dataran Gemilang, here this evening, amidst the colourful and noisy atmosphere. The theme of this year’s carnival was “Inspiration is the Catalyst of Innovation” which was aimed at sparking interest in creativity among students. The carnival featured the Inter College Arts Festival (ICAF) finals an annual event at UKM. The competition is one of the cultural events organised on campus to encourage undergraduates to participate in arts and cultural activities. Some 18 categories of cultural events were held involving all the residential colleges in the University. Among these were theater, Boria, al-Quran reading contest, netball and many others. Keris Mas Residential College emerged the overall Champion of ICAF with Tun Hussein Onn College second and Tun Dr Ismail College in third place.